Copious amounts of road salt are used each winter to protect roads from ice and preserve safe driving conditions. However, this is gradually degrading the concrete they are made of. Engineers are quite aware of the fact that calcium chloride salt, universally used as deicer, reacts with the calcium hydroxide found in concrete to form a chemical byproduct that causes roadways to crumble. A Civil Engineer from Drexel University is developing a new method for making concrete, using cast-off products from furnaces that can endure against the forces of chemical erosion. Over 900,000 tons of deicing salt is used every winter in just Pennsylvania. Winters in the Northeast add pressure on Departments of Transportation to maintain roads clear using the deicer which is an effective part of that process. However, this also contributes to several miles of roads that need to be patched and repaired annually. Yaghoob Farnam, PhD, an Assistant Professor in Drexel’s College of Engineering and Director of the Advanced and Sustainable Infrastructure Materials Research Group, is seeking to solve this problem with a new recipe for concrete. Farnam developed a technique for using slag, fly ash and silica fume — remains from the smelting process and coal furnaces— in a new concrete blend that is more durable because it does not react with road salt. His research findings have been recently published the journal of Cement and Concrete Composites. Many departments of transportation have reduced the amount of calcium chloride they use to melt ice and snow, even though it is very efficient at doing so — because it has also been found to be very destructive. This research proves that by using alternate cementitious materials to make concrete, they can avoid the destructive chemical reaction and continue to use calcium chloride. The goal of Farnam’s research is to create a concrete mix as strong as the ones presently used to construct roads, but containing less calcium hydroxide, which is the ingredient that reacts with road salt to form a compound called calcium oxychloride. This chemical tends to expand when it is formed, causing a reaction in the pores of cement, which leads to degradation and cracking. Farnam’s research led him to conclude that these “supplementary cement materials” could be replaced into the mix with a better result when they make contact with calcium chloride deicing salt. There is a great push to use these power industry byproducts because they take up space and some of them can be harmful to the environment. We believed that portions of the byproducts such as fly ash, slag and silica fume could be used to make concrete that is both durable — and cheaper, because it uses recycled materials. To assess his theory, Farman’s lab developed cement samples using varying quantities of silica fume, fly ash, and slag, they compared them to samples of “ordinary Portland cement” — the most regular type used in roads. His findings established his hypothesis, specifically that the samples containing more cement substitute materials did not create as much calcium oxychloride. An analysis of the standard Portland cement samples, via X-rays, acoustic emissions and microscopy, showed damage after merely eight days of exposure because of the formation of calcium oxychloride while samples with the right amount of silica fume, fly ash, and slag did not display damage during the testing period. The research also exposed that higher concentrations of calcium chloride create more calcium oxychloride when it reacts with concrete. 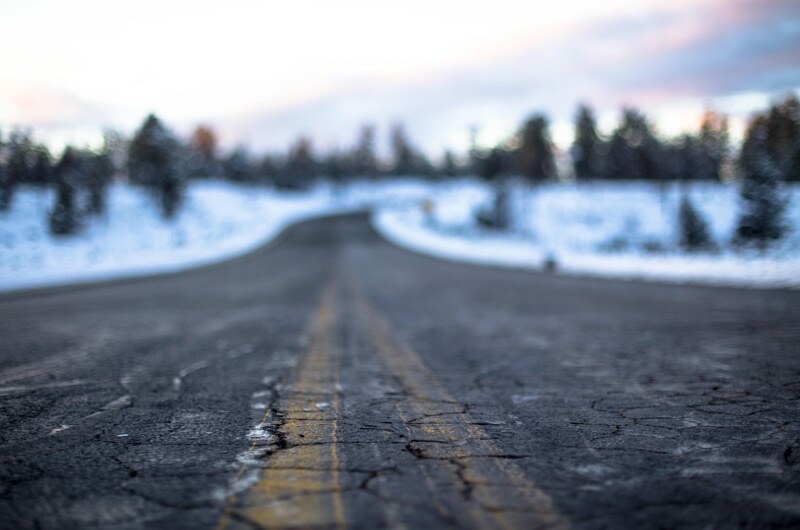 Therefore, theoretically, using lower concentrations of calcium chloride on roads could help prolong their life, but it would also render it less effective as a deicing agent. An additional concern is that calcium oxychloride can form even if the concrete is not undergoing a freeze-thaw cycle. It is a chemical reaction that can happen at room temperature, so it can take place when the roads are pre-salted even if ice doesn’t form. And as the salts remain on the surface after a snowstorm the reaction will continue to degrade the road, so it is vitally important to minimize this reaction in order to preserve the infrastructure. Going forward, Farnam’s lab will pursue ways to enhance the materials used in state infrastructure. They are presently focused on a technique for making a protective layer on the surface of concrete by using bacteria that can stop calcium oxychloride formation.